This is the story of one woman’s life-long interaction with beings from another world, and her journey to go beyond the fear to find meaning and purpose. In this book she explores the abduction experience and shares with you the three important things they insisted she learn. 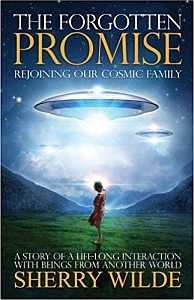 The narrative – the story – is about a family who made a promise many eons ago to be the fore-runners of the Ascension process (not unlike John the Baptist) and undergo the slow process of transformation to light in order to be a lightworker in these times of transformation. It is a shock to read that her “guys” – as she calls them – reveal to her that they go anywhere, any time, any place in service of the Creative Source of the All. That’s right, the ones we call aliens are actually here serving the Creator – who is known by many different names and forms. Their purpose? To prepare those on Earth for transition to the 5th Dimension and higher; the Earth herself is a sentient being and has awareness. The Earth was formerly in the higher dimensions and accepted beings on the surface who have caused Mother Earth to fall to the lower dimensions – the 3D reality, the stuff of our everyday lives. The Earth is going to take everyone on the surface into the higher dimensions. This would not happen at once, for the disturbance would cause too much loss of life. It will happen over time, then there will be peace. Peace will prevail on Earth. Those remaining on Earth (some will choose to go elsewhere; some will choose to join the ferry services to the stars and start civilisation elsewhere on other planets) will know they are multidimensional beings living in a hologram. They will know they are one with the Creator and one with all that exists – including everyone else. The will set aside their religious and cultural differences in order to help the human race evolve and live peaceably upon this planet they call home. There will be peace in the home, peace in the society, peace in the nation and peace on Earth. All people will monitor their thoughts and create a world where everyone can live with purpose, peace and love. The book propels the reader through the lived experience of encounter with so-called aliens, beings from the stars, the other worlds. These encounters run the full gamut of human feeling. These encounters arrive at a surprising conclusion. This book is a catalyst for living with purpose, living with unconditional love.